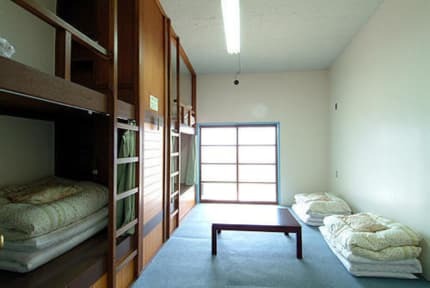 Amanohashidate Youth Hostel is located at the foot of Kasamatsu Park overlooking the famous 'Amanohashidate', one of the three most scenic spots in Japan. 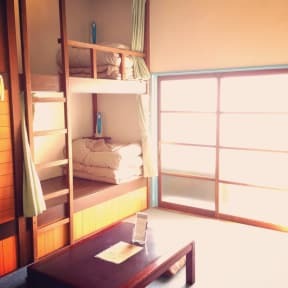 This YH is a very convenient accommodation as a base for tourism and leisure of the Tango Peninsula. Enabling you to stay within your budget and to meet people from all over the world are another attractive points of this youth hostel. Because of its location near Miyazu Bay, fresh seafood including snow crab is also available. Please use this YH for a gourmet trip, solitary journy, family travel. school trip or group seminar trip. Amanohashidate is located on the Tango Peninsula in the northern part of Kyouto Prefecture. It is a beautiful sandy beach, 2.3 miles in length and about 600 feet wide and is covered with over 6000 pine-trees. It is said to look like The Green Bridge to Heaven. It is famous as one of the three most beautiful spots in Japan since the old days and is popular with many tourists all year around.